Cardiopulmonary arrest (CA) remains one of the leading causes of death or disability in the USA. The chances of survival following CA are poor, despite fast medical emergency responses and better defibrillation techniques. The prevalent quandary in this field is the multi-factorial nature of CA: i.e. whole body ischemia, which compromises systemic blood parameters and cerebral, renal and cardiac functions, and consequent disruption of cerebral blood flow (CBF) and sympathetic over-stimulation, that results in severe and selective brain damage (i.e. neuronal cell death). Derangements of CBF occur hours after ischemia caused by acute hyperemia (increased CBF) and hypoperfusion (decreased CBF) and again one or several days after CA; there is hypoperfusion thought to be critical in CBF autoregulation detrimental to the brain. Cardiac arrest remains one of the leading causes of death and disability in the USA. The chances of survival following cardiac arrest are poor, despite fast medical emergency responses and better defibrillation techniques. The prevalent quandary in this field is the multi-factorial nature of cardiac arrest: i.e. whole body ischemia, which compromises systemic blood parameters and cerebral, renal and cardiac function, consequently disrupts cerebral blood flow and causes selective brain damage (i.e. neuronal cell death). Derangements of cerebral blood flow can occur minutes after ischemia caused by acute hyperemia (increased cerebral blood flow) with subsequent hypoperfusion (decreased cerebral blood flow) and again 24 hrs after cardiac arrest; there is hypoperfusion both thought to be critical in cerebral blood flow autoregulation to influence neuroprotection. The importance of identifying regulatory factors that influence cerebral blood flow autoregulation and innovative neuroprotective agents in the context of cardiac arrest is paramount to change the outcomes following cardiac arrest. We are currently investigating a new vasotone regulatory mechanism, the release of palmitic acid methyl ester (PAME) (novel vasodilator1/neuroprotection agent2) derived from the superior cervical ganglion (SCG) that innervates major cerebral arteries. The SCG innervates major brain arteries such as pial, basilar, and circle of Willis and is home to PAME, which is released from the electrically stimulated SCG in the presence of arginine derivatives such as L-arginine and Nw-Nitro-L-Arginine (nitric oxide synthase inhibitor). Administration of PAME caused endothelium-independent vasodilation and increased cortical cerebral blood flow (in vivo) more potently than some nitric oxide donors. 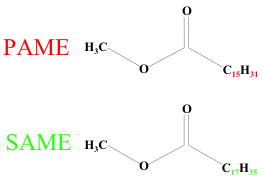 Direct application of PAME (EC50=0.19nM), but not palmitic acid (a precursor for PAME), onto the rat/rabbit thoracic aorta denuded of endothelium caused vasodilation, suggesting that methylation of palmitic acid is crucial for vasodilation1. Therefore, we are investigating the regulatory mechanism(s) involved in palmitic acid methylation to form PAME in order to gain further insights into cerebral blood flow metabolism and functional behavior outcomes. 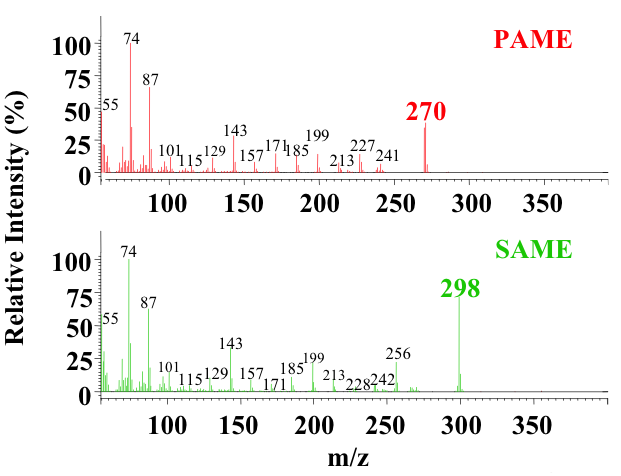 Since PAME’s release is enhanced in the presence of arginine derivatives, we are investigating protein arginine methyltransferases (PRMTs) as regulatory “switch” for the methylation of palmitic acid. Arginine methylation (via PRMTs) is a prevalent posttranslational modification that can occur in both nucleus and cytoplasm; both are thought to be involved in many disease processes. However, PRMTs have not been documented in the functional role of methylation of palmitic acid released from the sympathetic nervous system to modulate brain cerebral blood flow and metabolism that may lead to possible functional changes in normal as well as diseased states. Our main goal is to determine the regulatory mechanism(s) of vasodilation and neuroprotection of PAME derived from the sympathetic nervous system. Fatty acid methyl esters are inherently interesting and most of the functional aspects of fatty acid methyl esters still remain unknown. This is problematic due to the lack of specific biomarkers for fatty acids. Currently, it is not yet possible to detect the localization of a specific fatty acid due to the lack of specific radioactive or antibody labeling a specific fatty acid chain. Another major problem arises from the complexity and high variability of these fatty acids. Even if specific biomarkers do exist for PAME and SAME, the question of additional side chains and saturation (complete or incomplete saturated fatty acids) of a specific fatty acid remains problematic. Thus, currently we can only detect the presence of fatty acid methyl esters by utilizing mass spectrometry but the method cannot be used to directly determine fatty acid localization within tissue types. Our laboratory is currently developing biomarkers specific to PAME and SAME in order to better understand PAME/SAME physiology. The second project in my laboratory is to investigate the sympathetic nervous system as it relates to cardiac arrest. One prominent hallmark of cerebral ischemia is the inherent enhanced activity of the sympathetic nervous system due to increased norepinephrine and neuropeptide Y. The pathophysiological function of the sympathetic nervous system on ischemia-induced injury is highly complex and rather controversial. Attenuation of norepinephrine aggravated transient ischemia-induced rat brain damage, while enhanced recovery from ischemia was prevalent in the norepinephrine-depleted brain. Neuroprotection can be achieved pharmacologically by a neuropeptide Y receptor agonist under focal ischemia. On the contrary, neuropeptide Y has been reported to be associated with memory acquisition impairment. These limited studies are conflicting/controversial; therefore, we sought to delineate the pathophysiological mechanism(s) of the sympathetic nervous system after cardiac arrest. We recently reported that attenuation of the sympathetic nervous system via decentralization (DEC, interruption of preganglionic fibers) of the superior cervical ganglion can decrease asphyxial cardiac arrest (ACA)-induced hypoperfusion, afford neuroprotection, and reverse cardiac arrest-induced working memory deficits. DECpre+ACA decreased neuropeptide Y mRNA and protein levels suggesting that attenuation of the sympathetic nervous system during cardiac arrest can decrease neuropeptide Y levels. Our goal is to delineate neural pathways and neurotransmitter(s) involved with the benefits of sympathetic nervous system attenuation during cardiac arrest by inhibition of neuropeptide Y release via presynaptic neuropeptide Y-2 agonist (PYY3-36). We are currently investigating the modulation of neuropeptide Y. We hypothesize that a decrease in neuropeptide Y can inhibit the excessive activation of the sympathetic nervous system caused by CA to alleviate cerebral blood flow derangements, prevent neuronal cell death and neurological deficits. These studies are ongoing and will not only highlight the importance of SNS modulation to cerebral ischemia, but also seek to clarify the controversial studies and conflicting reports to further set the stage for future studies. The innovation of this proposal is attenuation but not enhancement of the sympathetic nervous system is actually beneficial to maintain cerebral blood flow, promote neuronal survival and functional recovery after cardiac arrest. In addition, the use of neuropeptide Y modulation therapy via (PYY3-36) can prove to be beneficial to combat against ischemia-related neuronal deficits. Investigating the function of the sympathetic nervous system after cardiac arrest in the brain can lead to novel therapies and allow for further exploration of possible mechanism(s) (i.e. neural networks) and provide a basic understanding in the brain via the sympathetic nervous system highway, as it relates to ischemia, to formulate new translatable therapeutic interventions. ​My inherent interest in Project 1 with regards to palmitic acid methyl ester lead me to the field of fatty acid biology. Fatty acids are interesting and challenging in that therapeutic targets are unclear. Much of therapeutics target protein/peptides. However, as a scientific community, we are ignoring a whole class of compounds inherent to biological systems that need further investigation. I currently have multiple consultation contracts with companies such as Sancilio and Company, Lipid Biologics, and New Health Sciences. One of the barriers utilizing docosahexaenoic acid/Omega-3 as a therapy is the inherent poor bioavailability after ingestion of these polyunsaturated fatty acids. Pharmaceutical firms including Sancilio and Company are racing to the finish to design novel excipients that have better absorption and bioavailability. We currently have a joint venture with Sancilio and Company to study the effects of sickle cell disease with regards to brain circulation utilizing docosahexaenoic acid as a therapeutic. Docosahexaenoic acid is a polyunsaturated fatty acid and has been implicated in various therapeutic. We are currently determining if chronic docosahexaenoic acid treatment will enhance cerebral blood flow, systemic blood flow (i.e. increase in red blood cell velocity) and also red blood cell flux. We use novel in vivo imaging of the cerebral microvessels via intra-vital two-photon laser scanning microscopy under hypoxic conditions. This is due to the fact that vaso-occlusive crisis in sickle cell patients normally occur under hypoxia.